In 2002, K.K. Agrawal of Jaipur, India, visited Bangkok and treated the IWGS email list (to join go to http://www.iwgs.org/services/emailist.htm ) to a stroll through Bangkok's famed flower and plant market. Several other list members, Rich Sacher of Louisiana USA and Rainer Gaide of Thailand joined in with information about the market. K.K. wrote: When I was in Bangkok, I took these pictures in the Chatuchak market where vendors from all over Bangkok assemble once a week to sell their plants. They were real flowers. I myself did not believe it when I saw them for the first time. They were available with short as well as long stems and the price ranged from $ 0.10 to $2.00 each. Plants were also available. Seeds were available but they were not the named ones. Rich continued: It is almost distressing to see the way they sell water lilies and lotus in Thailand's markets...bare root, and just piled in a heap in a basket...or on the floor! But since the humidity hovers around 90% and the market is shaded...there is little chance the lilies would dry out. BUT: the lovely basket of real flowers with impossible color combinations are most likely dyed! My guess is that portions of the flowers are dipped into various dyes to get the striking color combinations which we saw in the photo. As poorly as Thailand's economy is doing right now, if such colorful lilies existed, they would be exporting them by the thousands...and at a premium price! K.K. : This is another heap of lilies. I agree with Rich in thinking it is the climate which supports such kind of treatment of the plants. With a second look at the heap I noticed that the flower spikes are of different plants and not of the plants placed horizontally. This must mean the flowers are in planters on the floor and have been pushed out of the plants lying horizontally. < Now it is clear that the flowers are artificial because there are two more baskets below the lily one. They are of roses and some of the roses are blue. Blue roses !!!!!!! Rainer Gaide wrote: A visit to the plant wholesale market (Chatuchak) on a Wednesday or Thursday morning (emphasis on MORNING -- 5-8AM!!) is a must when visiting Bangkok and will satisfy your itch to see all aquatic --and many other -- plants available in Southeast Asia. Yes, there are sellers at the market who sell plants with dyed blooms, but they are in the minority, maybe two or three sellers out of over 300. Most sellers are honest and would admit if the blooms have been dyed. Overall I would say that our plant wholesale market at Chatuchak offers the biggest variety and lowest prices of all kinds of plants in Southeast Asia. Most hardy water lilies cost less than US$2 retail and most tropicals range in price from $5 to $10 retail, all including pot! As an example, we just bought 15 palms 'Roystonia regia' five meters overall height at US$9 per palm. 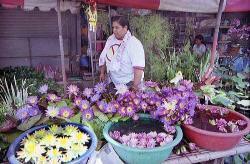 We buy tropical water lilies at the Chatuchak plant market by the hundreds every Wednesday. They are usually sold in pots (8-12" diameter) with clear identification stating the Thai name and registered botanical name. There are a few sellers who sell bare root water lilies, usually not named. They sell them as 'small pink, big pink....etc.' costing from $0.25 - $0.50 per plant. Lotus plants are often sold bare root in baskets for the purpose of being used for food. K.K. : My wife Sushma is a cook and she has written a book on vegetarian cooking. She was also surprised to know that the whole plant is suggested to be eaten as food. The roots of the lotus plants are cooked as vegetables but never the leaves, stalk or flower. Therefore I assumed that the plants were being sold for growing/transplanting and not for eating. Rainer: When I mentioned bare root lotus being sold here for food, it is true that the entire plant is sold but only the tubers and some stalks are actually being used for food purposes, the rest of the plant being discarded. Yes, the flower stalks of some lotus plants are used here for cooking. Of course the lotus plants being sold here primarily for food can also be used as plants in a back yard.